Can you imagine your life without a car? Pretty tough, right? Going to work, parties, vacations – your car is probably the object you use the most. Cars aren’t biological creatures, but they have one thing in common – both age over time. Just as people use special, healthy diets in order to prolong their lives as much as possible, a similar thing can be done with vehicles too. As you are aware that cars can NOT be feed with broccoli, the substitution for them is a good motor oil. Why does your car need a good oil, what types of oils are available and what are the benefits of it? Continue reading to learn this and much more. When my car is considered old? Is synthetic oil better for high mileage cars? When to switch to synthetic oil in a new car? Can you mix semi and fully-synthetic oils? Can you mix semi-synthetic with conventional oil? Can you switch from synthetic to regular oil? What happens if you use regular oil instead of synthetic oil? Is it 5 years? 10 years? Or, 15 years? There isn’t one answer to this, as it depends on how much your engine is worn out. The engine wears out by driving, even though it is true that you can save the engine by not driving it – in the end, why did you buy a car if you are not planning to use it? Rather than years of using, it is better to focus on mileage. Cars with high mileage are more likely to require a good engine oil. Again, there isn’t any standard to define what is a high mileage engine, but if you pass more than 75,000 miles with your car you are at risk of many potential problems. This time, we checked the best selling oils to help you make the right pick. 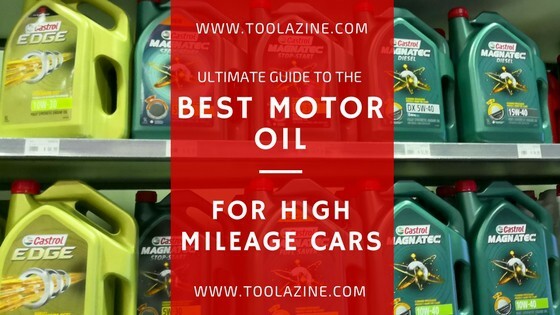 As you will notice, most of them are synthetic oils and you will learn the reason for that after reading this article. It is an advanced, full synthetic oil that will keep your vehicle in such a great condition that anyone will think you have just bought it. It meets the toughest standards and it beats every conventional oil with its quality. It is great for different types of vehicles, even for ones with turbo engines. The number of reviews should be enough to convince you and in case you were wondering how much you need to spend on it you can check the latest price of the Mobil 1 120764 Synthetic Oil here on Amazon. This synthetic oil is designed to offer better fuel economy and outstanding engine protection while meeting all requirements and latest standards. How much fuel can you save? This depends on the vehicle, but you may be amazed by the results once you try this oil. It offers great overall lubrication and wears protection at different temperatures. You can check the current price of the Mobil 1 120758 Full Synthetic Motor Oil here on Amazon. Incredible 3/4 of the engine wears occurs within the first 20 minutes of engine warming up. However, this won’t be a problem if you decide to use this oil. It reduces the wear dramatically and makes the parts of your vehicle up to 4 time smoother. Plus, it adds a layer of protection while warming up that stays for longer periods. Most of the oils of this type require you to spend a load of cash for them, but the price for this one is really affordable. You can check the latest price of the Castrol 03057 Full Synthetic Motor Oil here on Amazon. Money can’t buy happiness, but it can buy this oil, which is about the same. It is a premium oil for car lovers that want the best possible performances from their cars. The new thing here is – this oil acts differently when under pressure as it reduces the friction like no other oil. The titanium technology provides great performances, anti-wear, and anti-deposit protection. Without any doubts, this is the best motor oil you can find on the market. Check the current price of the Castrol 03124 Advanced Full Synthetic Motor Oil here on Amazon. It doesn’t have the best-designed package when you compare it to the other products on the shelf, but it still does the job very efficiently. It is a high-quality oil with detergent additives which makes it convenient for use for many different vehicles. Is there any proof of the quality? It is tested by many engineers that guarantee that this oil will not disappoint you. You can use it for 2 seasons once you open it, so this product is a good pick. Check the current price of the Briggs&Stratton Engine Oil here on Amazon. If you want to keep your car’s engine running just like when it was new, you should consider this motor oil. It will offer great lubrication and maximum protection under any weather conditions and don’t forget to mention the perfect balance of additives. It will prevent any deposits or sludge which means one worry less for you. Still looking for the right product? Go for this one and you won’t regret it. Check the current price of the Mobil 1 120766 Motor Oil here on Amazon. Looking for a product that will bring your car back to life? This is it, this oil is designed specifically for high mileage car engines. It is much better than the conventional oils, for these reasons – it protects critical engine parts, reduces the sludge and deposits that regular oils may leave behind and prevents leaks. If you have passed more than 75,000 miles, this is the product that can keep your engine in good shape. Check the latest price of the Mobil 1 120769 High Mileage Motor Oil. Mobil 1 is one of the leading producers of motor oils. But why you should consider exactly this one? It is made by following the most strict standards and rules and offers protection as the conventional oils could not. It offers outstanding protection and it deals efficiently with sludges and deposits. It is fuel-economic and provides maximum protection in different weather conditions. You can check the latest price of the Mobil 1 96989 Synthetic Motor Oil here on Amazon. Not every manufacturer can show off with protection and strength under pressure, but Castrol is definitively one of them. And, their oils are one of the very best available. Different driving speeds may create metal-to-metal friction that can damage your engine. However, that shouldn’t be your concern if you are using this oil product as it will offer maximum protection and performance. It decreases the deposits and sludges as well, so it is easy to notice that this motor oil is a good pick. Check the current price of the Castrol 03101 Full Synthetic Motor Oil here on Amazon. This synthetic motor oil is basically everything your car will ever need. Full synthetic motor oil with a combination of additives for maximum performance and high protection. It has improved wear performance as well as deposit control while following all the API standards as well. It offers better fuel economy, and bigger heat resistance without compromising durability. It has a shear stability in order to resist viscosity loss and maintain optimal pressure. Check the latest price of the Shell ROTELLA Synthetic Motor Oil here on Amazon. In the table below you can see which are the potential problems, you can expect with a high mileage motor. Oil consumption/oil leaks It doesn’t matter how much you pay attention to every single part of your vehicle, the seal can erode after a while and the result of that is oil leaking. It is crucial to choose the right engine oil as not every oil has additives that will protect the seals and prevent an oil leak. Oil sludge A sludge is something you will face if you don’t change the oil frequently. It is a residue that looks like a tar and can be build up in your engine. Regular oil replacement will remove any sludge and reduce the engine wear. After years of using it and many miles passed, the engine can wear out. The only thing you can do to prolong their lives is to use an engine oil in order to minimize the engine wear and extend its life. Making the right pick isn’t as easy as it seems. It is far more complicated than buying kitchen oil, as I guess you don’t check several parameters when picking cooking oil. To start with, there are three basic things you need to do. Start with checking your car’s manual and you will find the suggested oil weight there. Next thing you need to do is to check for the starburst symbol on the package, which is an indicator that the particular oil has been tested but also approved by the American Petroleum Institute. Finally, pick the right viscosity according to your vehicle’s normal operating temperatures. You can find this info in the owner’s manual as well. However, you need to learn much more until you can make the right pick. All of the labels that can be found on the package, have a meaning. But in order to differentiate the products, you need to understand what the label is telling you. This is the simplest possible definition – the resistance of the fluid to flow that can be rated at 0 degrees F (the W mark represents winter) and 212 degrees F. These temperatures are in correlation with the weather conditions and is something you need to consider. For example, an oil with 20W-50 is more viscous in both hot and cold temperatures than a 10W-30 does. What is the logic behind this explanation? On hot temperatures, the oil is thin, and in cold temperatures the oil is thick. As I said above, the oil has additives – in this situation, they help you not to thin the oil very much which so the oil will have different viscosity rates at different temperatures. That resistance explains the second number (10W-30) and bigger number means more resistance. Enough of this, let’s keep things simple – when you drive the car, the engine heats up the oil and it needs to stay thick. So, follow the user’s manual to find the right viscosity for your vehicle. Seriously, engine oil is the food for the engine – the oil lubricates all the moving parts and keeps them clean so the engine as a system will function properly. You have decided to buy a motor oil, you take your card go to the market and stand in front of the shelf with huge variety of engine oils. You are aware of what you need to look for, you took your car’s manual with you, but that just seems like not enough. Conventional oil, synthetic oil, high mileage oil… what should you choose? Understanding the difference between these types can be really tough. In order to make things easier for you, I decided to make a comparison. Nowadays, vehicles are designed to last longer, of course, if you take care of them. If you carry about your car, you will reach far more than 75,000 miles. Older cars, or cars with more mileage will start leaking oil at some point. This means that it is time to do some changes and refill the oil tank more often, which wouldn’t be the case if you own a brand new car. The reason for this is that the seals have hardened over the years and they may start leaking oil or, much worse situation – they can crack. This means you need an oil that can go through the pores of the seals, bring back their shape and boost the flexibility. In order to achieve this, you will need a higher mileage oil made from special ingredients. Remember when I talked about viscosity? Well, higher mileage oils have higher viscosity compared to other types. This will help you with the issue of worn out engine, and increase the actual performances of your vehicle. Synthetic blend oil is a mixture of synthetic and organic oil. Why would someone mix them? Because this combination provides great protection for high heats and heavy loads. As you may have guessed, this oil type is used primarily by pickup drivers. If we forget about the protection it offers for a minute, here is another reason why people use it – it is economic. It needs more time to turn into vapor, which we cannot say for other oil types and the result of that is no oil losing. However, if you make a comparison between the prices, you will notice that the conventional oil is just a bit more expensive. This types cover every possible vehicle and are designed for different temperatures. The thing you must remember is not to let the indicator warn you that you need to change the oil – do that regularly. The ideal interval is every 4 months or after every 4000 miles. Synthetic oils can be split into two sub-categories: semi-synthetic oils and fully-synthetic oils. What are the differences? Firstly, semi-synthetic oils are cheaper which is basically normal, since they don’t have the same ingredients as the full-synthetic oils. Next, semi-synthetic oils are a combination of synthetic and mineral oil which can offer you higher protection. In addition, many drivers prefer this oil mostly because of economic reasons – it is cheaper and it doesn’t evaporate as other types. On the other hand, fully-synthetic oils are clean synthetic oils with no additional types of oil. This is the best choice for your engine as it will give you maximum protection and high-level performance. Even though they are more expensive, the difference isn’t much big. If you are looking for a consistent but also superior performances, then your choice should be synthetic oil. It is up to you to decide what oil type is better, but consider these facts before deciding. Synthetic oils have several advantages for sure – they offer protection in a wider range of temperatures, even higher than the engine’s maximum. Plus, they are thinner and are not as degradable as the mineral oils and are fuel efficient as well. People are often afraid to switch to synthetic oil as they think that would bring more disadvantages than advantages. However, in this section you will learn that there are many benefits from the switch, so you would like to do it immediately. It is not true that the switch from mineral to synthetic oil is a one-way transition. You can go back to it whenever you like, even though I doubt that you would ever want to go back. Another myth that is completely wrong – synthetic oil would leak where other types won’t. Synthetic oils may just offer better performances and seals protection. The point is that you don’t need to worry about unnecessary things – it is completely safe to switch to synthetic oil without any engine damages or future consequences. Absolutely not. If your intention is to switch between these types, then okay, just make sure you use a flushing oil before. But don’t even think of mixing them together, as that would not only change the ratio but can cause serious damage to the engine. Yes, you can, as there is no possible damage of doing that. But notice one thing – the conventional will reduce the benefits of the semi-synthetic which is superior. Even it is possible without any harm to the engine, I wouldn’t recommend you creating this mixture. As I mentioned before, just as you could switch from regular to synthetic oil, there is absolutely no problem to do the same thing in the other direction. You can switch from synthetic to regular oil without any damage to the engine. Well, oil is oil, so it whether it is synthetic or petroleum based, it will work fine. So, probably there is not a big difference, as you need to consider many things before you can choose the oil type. There isn’t any guarantee that one of it will prolong the life of your engine, even though the synthetic oil is in favor as it has better chances. Let’s make a little comparison – if you are living healthy and have enough physical activities, you are more likely to live longer, but no one can guarantee you that. Additives are a good option and they can help you very much. However, you can’t make the situation better with putting more of them. You can only do the opposite, and create new issues. Plus, some of the additives can neutralize others, or together in combination can create reactions that can be harmful to the engine. So, think twice before you use them as you can make the situation even worse. What type of oil do you use? Would you change it to another type and why? Post your opinions in the comments section below and you can include your favorite product as well. There is a lot of different oil options available. If you have a high mileage car and you just want the best protection, because a bottle of oil is much cheaper than fixing a broken engine, then I would just go for the Mobil 1 120769 High Mileage Motor Oil. After all, it is a top of the line synthetic oil from the top oil manufacturer and specifically designed for high mileage engines. It may not be the cheapest but with engine oil you really do get what you pay for. A great way to thoroughly wash your car is with a pressure washer suited for car cleaning. Learn how to wash your car the right way. Should you dry your car after washing?